Here stood Bethesda Church, founded about 1830 and used by Baptists and Disciples of Christ until it burned in 1868. In May 1864, during the Civil War, Maj. Gen. Gouverneur K. Warren's V Corps formed the left flank of Lt. Gen. Ulysses S. Grant's Union line here, facing Gen. Robert E. Lee's army. On 30 May, Lt. Gen. Jubal A. Early's attack on Warren's position failed. Early attacked again on 2 June, but was beaten back by Maj. Gen. Ambrose E. Burnside's IX Corps. The next day Grant assaulted the center of Lee's line at Cold Harbor and was defeated with enormous losses. Location. 37° 37.708′ N, 77° 17.694′ W. Marker is in Mechanicsville, Virginia, in Hanover County. 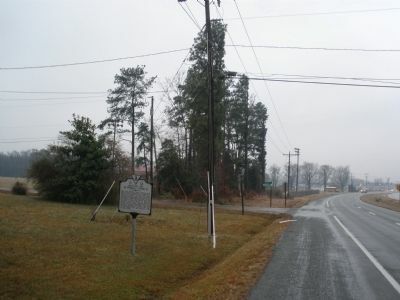 Marker is at the intersection of Mechanicsville Turnpike (U.S. 360) and Hughes Road, on the right when traveling east on Mechanicsville Turnpike. Touch for map. Marker is in this post office area: Mechanicsville VA 23111, United States of America. Touch for directions. marker also named Cold Harbor Campaign (approx. one mile away); Battle of Cold Harbor (approx. one mile away); a different marker also named Battle of Cold Harbor (approx. 1.1 miles away); a different marker also named Battle of Cold Harbor (approx. 1½ miles away); 36th Wisconsin (approx. 1.8 miles away); "Liberty Hall" (approx. 1.9 miles away); June 3, 1864 — 18th Corps: A Disastrous Attack (approx. 2.2 miles away). Touch for a list and map of all markers in Mechanicsville. More. 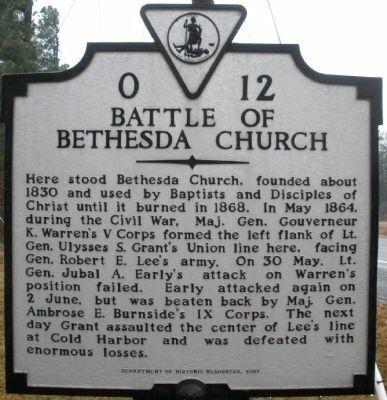 Search the internet for Battle Of Bethesda Church. Credits. This page was last revised on June 16, 2016. This page originally submitted on January 27, 2009, by Bernard Fisher of Mechanicsville, Virginia. This page has been viewed 3,717 times since then and 65 times this year. Photos: 1, 2. submitted on January 27, 2009, by Bernard Fisher of Mechanicsville, Virginia. • Craig Swain was the editor who published this page.